Granite Peak isn’t the tallest highpoint (McKinley in Alaska is; Granite is number 10) nor the most remote (Gannett Peak in Wyoming is more remote), but many people have claimed that it is the most difficult highpoint to climb next to McKinley. 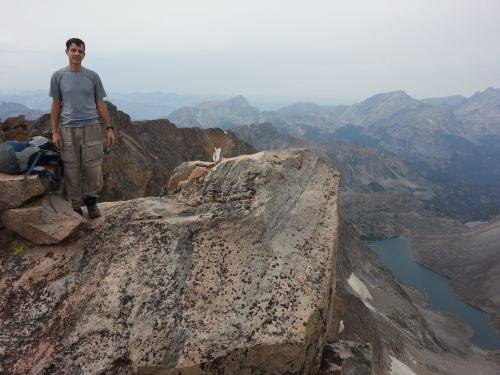 Having climbed to the top of 39 other highpoints, including the tallest in the lower 48 (Whitney), I’m inclined to agree. Prior to our trip, we did a fair amount of research on the hike and what we should expect. We knew that the final ascent of the summit was pretty intense and ropes and harnesses were recommended. We also read up on the routes up to the summit. However, this is where we found some contradictory and unhelpful information. The standard route up Granite Peak starts at the Mystic Lake trailhead, hikes up to the Phantom Creek trail, follows that up the switchbacks to Froze-to-Death Plateau, then continues to the top of Froze-to-Death Plateau (which ends in Tempest Mountain). At that point, the trail drops off the edge of the plateau so you can hike to the saddle between Tempest Mountain and Granite Peak. Summit attempts start at the saddle. This is the standard route and is estimated at about 22 miles, round trip. There are two alternate routes. One starts at the East Rosebud trailhead and comes up the valley next to the valley in which Mystic Lake lies. This route is substantially longer than the standard route, but the elevation gain is much more gradual. This route meets up with the standard route on Froze-to-Death Plateau. This is often referred to as the Rosebud or East Rosebud Route. The final route splits from the standard route at the switchbacks. It is largely off-trail from where it starts at the far end of Mystic Lake. At the end of Mystic Lake you cross a stream then turn off the trail and head towards the lake that feeds that drainage. That lake is called Huckleberry Lake and this route gets it name from that lake as it is called the Huckleberry Route. From Huckleberry Lake you work your way up to Princess Lake, then Cold Lake, and finally Avalanche Lake, which lies in a valley below the saddle and summit of Granite Peak. From Avalanche Lake you have to climb a boulder and scree field up to the saddle, from where you can approach the summit. I’m detailing all of these routes at the beginning of this trip report because the reports we read online covered primarily two – Huckleberry and the Standard Route – and some of those reports had very inaccurate information. In particular, this trip report said that the Huckleberry Route was a shortcut and that the entire mountain could be climbed in a distance of just 12 miles, round trip. Remember that number. One of the people I was hiking with, Mark, found the misleading and inaccurate trip report on the Huckleberry Route and, thinking he would make our trip easier, suggested we try following the Huckleberry route. My other hiking buddy, Tom, and I weren’t very keen since the report stated that it involved a lot of bouldering and that there wasn’t a clear trail. We didn’t make a decision before we started the hike and figured we’d make one when we had too. With the background on routes out of the way, here’s what we did. I met up with Mark and Tom on August 17th in Utah and we drove north to Bozeman Montana where we stopped so Tom could get a haircut. We were running earlier than we expected, so we also stopped for a movie and dinner, then continued on to Columbus, MT, where we spent the night in the Super 8. We got up early, grabbed a bite to eat, then headed to the Mystic Lake trailhead. Our goal was to get close to the summit the first day then camp. We’d summit early the next morning then hike all the way out by the evening of the second day so we could check in with our significant others to let them know we were safe. However, we all had Monday the 20th off, so we could extend the trip slightly if we needed to. We geared up and were on the trail by 8:00 am. Since our hikes are really more about catching up with each other, we weren’t paying all that close of attention to the routes and the distances we had hiked. It takes almost 3 miles to get to Mystic Lake, one way. Add that to the return distance from Mystic Lake and you’d think that Granite Peak was just another 3 miles away based on the erroneous trip report we had read. I had a GPS unit and had marked some key features on it as waypoints, including the various lakes, Froze-to-Death Plateau, the saddle, the summit, and the bottom of the switchbacks. When we reached the spot where the Phantom Creek Trail splits off from Mystic Lake, we had to make a decision. Should we follow the trip report that suggested the whole climb was just 12 miles if you take the Huckleberry Route or should we follow the standard route. Just as we began discussing this, a guy heading toward the trailhead who had spent a few days fishing on the lakes stopped to chat with us. He said the lakes on the Huckleberry Route were beautiful and full of fish and since Mark had a fishing line and lure, we ultimately decided we’d take the Huckleberry Route. This would prove to be a very poor decision! The stream you see in the distance comes from Snowball Lakes, not Cold Lake. To the left of that stream is the ridge we didn’t think we could climb to get to Cold Lake. From the north edge of Princess Lake where we arrived, we could only see a trail headed to the right. We also saw a stream coming down into the lake from the far side of the lake but also to the right. Thinking that was the stream coming from Cold Lake (I didn’t check my GPS), we headed that way. About half way across Princess Lake we saw another stream coming into the lake that was east of the first. It was very pretty, but it didn’t even dawn on us that the second stream we saw may actually be where we were supposed to be hiking. We continued across the lake on a small rock bridge then headed up the hill on the far side. There wasn’t a discernible trail, but there were a number of rock cairns, which we followed all the way to the top of the hill. As we broke over the ridge, we saw another beautiful lake and thought we were at Cold Lake. However, I had marked Cold Lake’s location on my GPS and checked it only to find that we were actually at Snowball Lake. Snowball Lake is to the west of Cold and Avalanche Lakes and is still quite far from the scree field below the saddle. This would not have been much of a problem except there is a ridge that runs between the lakes that is several hundred feet tall with mostly vertical sides (see above photo). In short, it was not a ridge we could easily, safely, or quickly cross to get where we were supposed to be. It was 4:00 pm when we made our way around Snowball Lake and started to consider our options. 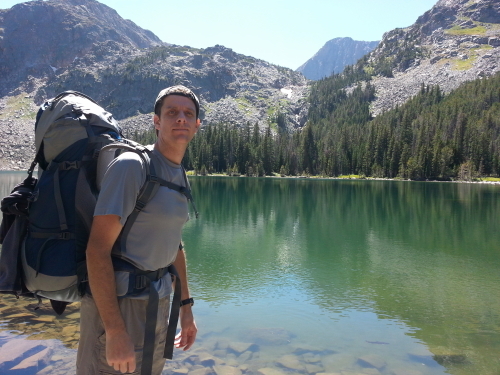 I took off my heavy pack and told the others I would scout ahead to see if we could go around the ridge and find the lakes on the other side as it seemed to taper off the closer it got to Granite Peak. I scouted ahead maybe a ¼ mile and it seemed like the ridge declined enough to be relatively easy to cross. With that in mind, I returned to Mark and Tom and suggested we spend the night at Snowball Lake then hike around the ridge the next day, head to the saddle, then summit, and camp on Froze-to-Death Plateau the next night, hiking out on Monday. It was at this point that Mark informed me that he had told his wife, Holly, that we would be off the mountain by the next evening – Sunday. That wasn’t good because we probably would not be. However, we had heard some people have cell phone reception on Froze-to-Death Plateau, so we were hoping that would be the case and we could get a hold of Holly so she didn’t call in Search and Rescue (SAR) to find us if we didn’t call her Sunday evening. Exhausted from close to 8 hours of hiking with heavy packs, much of it off trail and over boulder fields, we set up our tent, treated some water from the lake, then crawled into our tent and laid down until we fell asleep around 10:00. We woke up early the next morning, around 6:00 am, and broke camp. We started hiking around 7:00 or 7:30. As we had hoped, the ridge was passable at the far end of the valley, so we crossed over and found Avalanche Lake around 8:00 am. Unfortunately, however, we were on the wrong side of the lake. We had to cross to the other side, then walk all the way to the end of the mile long lake over a massive boulder field with very few indicators of a trail. This part was the most miserable of the hike for me as I really do not like bouldering with my bad knee. It was almost 11:00 before we made it to the end of Avalanche Lake. At the end of the lake, we still had about 1,500 feet of elevation to gain through builder fields and scree to reach the saddle. Mark, towards the end of the lake, decided to stay high up on the wall of the valley and make a gradual ascent toward the saddle while Tom and I opted to work our way up the bottom of the valley on boulder fields, then go straight up the scree toward the saddle. Tom and I made better time than Mark, but it was grueling, especially with our heavy packs on. It was about 1:30 before I made the saddle. Tom followed me into the saddle about 5 minutes later. Both of us were exhausted at that point from the rough terrain, but we were excited to ditch most of the stuff in our backpacks so we could move faster up toward the summit. However, about 10 minutes after Tom made the saddle, Mark limped in with blood running down his left leg. About 20 minutes earlier, unbeknown to us, he had stepped on a rock that was loose but holding up a much larger boulder. He lost his balance on the loose rock and fell, exposing his leg to the path of the boulder, which promptly rolled over his leg, balanced for just a second, then started to drop back down on his leg. He managed to pull his leg out in time, but the damage had been done. As a foot and ankle surgeon, he was in a good position to know the extent of his injury. He stood on it and, while it hurt, there was no shooting pain, indicating the bones were not broken. He could walk, just not very well. He made his way to the saddle and told us this, then told us that he wasn’t going to summit. We figured that he wasn’t going to summit given his condition. The only question at this point was whether or not he was going to need help off the mountain. We asked him if he did, and he said no. He told us to summit but said he was going to keep moving so his leg didn’t stiffen up on him. We discussed options and decided that he would try to call his wife, Holly, on the plateau. I gave him my solar phone charger to get his phone working so he could make the call. He would head toward the plateau, call Holly, then hike as far as he could, hopefully getting off the mountain and to his car. Tom and I would summit then follow him. There was another problem, however. We couldn’t see the trail to the plateau. I saw a trail just below the saddle, but it looked like it went to the right or south of the ridge and I thought it might work its way around Tempest Mountain’s face to the plateau. We didn’t see any other trails. So, we told Mark to go to the right and see if he could find a trail. He did, again staying high on the ridge. We could also see some other people on the trail at this point – two hikers near the plateau and a few hikers in the saddle with a dog. Figuring that Mark was doing okay and that there were others around in case things took a turn for the worse, Tom and I continued up the boulder field toward the ridge. We aimed just to the south of the ridge, which was the wrong route and had to backtrack a bit. As I did, I noticed two guys coming up from the saddle. They were close enough at that point that I could yell to them so I told them to stay to their right toward the ridge. They then yelled up and asked if we needed help as they thought they heard us say that we did. I told them that we didn’t; we were yelling to a friend. They dropped one of their packs and continued up to meet us. They were planning on summitting but thought we had asked for help, so they were going to bring up some supplies but left them on the boulder field after we told them we were fine. We then worked together to get to the summit. They were younger, stronger, faster climbers, but had no ropes and their speed made them miss a couple of routes. From the top of the boulder fall, you have to climb down a bit then cross a snow bridge, which had a rope run across it to help. After the snow bridge, you climb two chimneys, both of which have anchors at the top as they are technical climbs. At the top of that ridge, you drop down one more time, then climb several more chimneys, including a couple of really difficult, exposed areas, but that gets you to the top. Working together, all four of us summitted around 4:00 pm without using ropes and harnesses. We had brought a rope and harnesses and were planning on using them on the way down. The other two guys, Adam and Nathan, didn’t have ropes and decided they could hike down without them. We only stayed about 20 minutes on the summit as we knew we needed to get off to find Mark. Adam and Nathan left before us. Tom and I didn’t use a rope on the first chimney, but we did on the second and third. We then crossed to the last two and used a rope on those as well. This slowed us down a bit, but we felt pretty safe. For those planning on rapelling at the summit, the anchors that are in place are pretty robust and didn’t look particularly worn. We made it back to the saddle around 6:00. We put our heavy packs back on and started up the trail toward the plateau. We reached the plateau around 7:00 pm and around 7:30 ran into the only other people we saw on the plateau – three individuals in two tents. We stopped to chat with them and they gave us some pretty poor directions to navigate the plateau and find the switchbacks. They also mentioned that they had seen Mark around 4:00pm and that he had told them he was headed to the car. Since the plateau is largely level, though there is no clearly discernible trail – just cairns marking waypoints – we made good time. We hiked until it got dark following cairns, then put on our headlamps – around 8:30 – and continued hiking. Since I had marked the bottom of the switchbacks on my GPS, we were able to target that location and hiked until about 10:00 pm. Unfortunately, we didn’t realize that you actually have to stay more southeast than we did or you run into some cliffs that block the route to the switchbacks. At 10:00 pm we hit the cliffs that blocked our route. We literally saw cliffs on three sides of us – we had hiked out onto a cliff and, without day light, really couldn’t go any further. We hiked back up a couple hundred feet, found a relatively level and grassy spot, threw down the tent, and climbed in for the night. We had a hard time falling asleep, but got a little sleep. We felt bad that we hadn’t made it out all the way out because we figured Mark had and that he would have had to sleep in the car while waiting for us. But it wasn’t safe enough for us to continue. At first light, around 6:00 am, we woke up, got out of the tent, and got our bearings. We realized that we were on cliffs overlooking the bottom of the switchbacks and we could see them. My GPS was sending us the right direction, we just didn’t realize we had to go around the cliffs in the dark. We packed up and started hiking around 7:00. We made okay time working our way around the cliffs and eventually started seeing cairns again. Around 7:30 we noticed something in the distance on a low ridge along our route. It looked kind of like a person waving a flag, but it wasn’t moving so we weren’t sure what it was. As we got closer, we began to realize that it was a person, and when we were within about 50 feet we realized it was Mark! He asked us for water, then filled us in on what had happened. He initially made okay time crossing to the plateau and arrived there around 4:00 when he saw the other people on the plateau and got directions. He also got a cell phone signal and called Holly, telling her everything was alright. However, he hadn’t told us he was low on water and he didn’t have any iodine pills to treat water. By 4:00 pm he was so low he ended up stealing some water from a Nalgene bottle he found on the side of the trail. He continued for 2 more hours, but kicked a rock with his bad leg, causing him shooting pains, so he stopped. He was almost entirely out of water at this point and wasn’t sure how much further he could go or which direction since the cairns on Froze-to-Death Plateau aren’t very clear. So he stopped, then called Holly and told her his situation: he was semi-lost on Froze-to-Death Plateau, out of water, didn’t know where Tom and I were, and a boulder had crushed his leg. He needed help. She helped him get in touch with Search and Rescue and they made plans to send people and horses in to find him and bring him off the mountain. However, given the time, they couldn’t send anyone until the next morning. So, Mark had to sleep on the mountain in just his sleeping bag. He was dehydrated, but he didn’t, despite the name of the plateau, freeze to death. 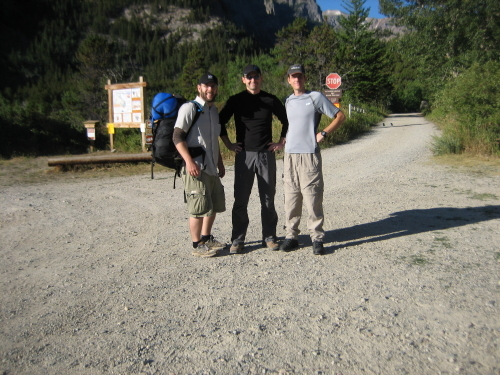 After we met up with him, we all started hiking and, despite his injured leg, we made okay time. With Tom scouting ahead and me walking with Mark, we found the switchbacks and headed down. We made it about half way down the switchbacks when we met up with two people from Search and Rescue. They explained that the horses had gone up the Rosebud route and were on the plateau. They had also sent two people up the Huckleberry route to find Tom and I. They got on the radio and told everyone they had found us, then arranged to have the horses come get Mark. Once Mark was safely with the Search and Rescue people, Tom and I took off, since we figured the horses would catch us. We made good time and met up with the SAR people who had gone up the Huckleberry route and ended up hiking out from Mystic Lake with them. They were very nice and told us some fun stories. We made it to the car at 1:30; Mark arrived a half hour later on a horse. So, what did we learn on this hike? First, the Huckleberry route is NOT A SHORTCUT! It is more scenic, but it is very rough terrain and is much more difficult than the standard route. It’s also the same distance – roughly 12 miles ONE WAY; 24 miles round trip. If you’re planning on taking several days to do Granite Peak, want a scenic route, and don’t mind hiking off trail over very rough terrain for hours and hours, try the Huckleberry route. If you want the fastest, easiest route to the top, take the standard route up the switchbacks and across Froze-to-Death. The summit can be done without ropes and harnesses. Going up, ropes don’t actually make a whole lot of sense unless you have a lot of time and a good lead climber followed by amateur climbers. The lead climber could carry the rope to the anchors and everyone else could be belayed up to the anchor spots. Really, ropes make a lot of sense coming down. Finally, Granite Peak, even with the short route, is a very challenging mountain. We got lucky. But I have a few other videos. how many more of these are you going to do?????? I hope the rest are not as bad. That one was scary!!! Glad you made it down ok.
After that one, I’m not sure how many more we are going to do. Probably not many. I still have six highpoints to do in New England, none of which are particularly dangerous. But the four big ones I have to do out west are all a bit sketchy and I may never get to them. I’d still like to do three of them, but we’ll see. That is very funny my first attempt on huckleberry got us. And we camped at princess lake. Must have looked at the same information before hand. Not a chance it was 12/miles round.